For whatever reason, God has chosen to use the insignificant and ordinary to change the world, which should give us all a little hope! I want to invite you to ask the Creator God to ignite your imagination to join others in creating our best communities, our best world, and in the process our best lives--in ways that both advance something of God's purposes and respond to some of tomorrow's urgent opportunities and challenges. - Tom Sine, Live Like You Give a Damn! I think by now most churches in the United States are at least aware that the way the wider culture views and approaches them is quite a bit different than it was a few decades ago. People no longer feel obligated to be in a pew every Sunday, sports and other activities have made church attendance one option among many, groups like the "spiritual but not religious," "nones," and "dones" are growing larger every year. Younger generations in particular see faith, discipleship, and church involvement much differently than their parents and grandparents, if they give consideration to such things at all. Given this awareness, churches and older generations have at least two options. First, they can gripe and grouse and blame societal groups and trends for all their problems, which plenty do quite extensively. Or, they can listen and pay attention to what energizes people outside their walls, and brainstorm how they can participate instead. In Live Like You Give a Damn! : Join the Changemaking Celebration, Tom Sine wants to make the case that the second option is the better one. He does so by paying special attention to what those of Millennial age in particular are doing to help improve the world through various causes and organizations, as well as what inspired them to take action and how they organized themselves to pursue their goals. Sine provides countless anecdotes from many corners of the world and his own life to show what can happen when we dare to imagine a different reality for our communities. At various points through the book, we meet people building roads in Haiti, improving waste management in South America and Asia, and removing crack houses from depressed neighborhoods. He shares the bold vision that carried each group through, as well as some of the pitfalls and roadblocks they faced along the way. It is notable that many of these do not necessarily have a local church at the center of its organization, and Sine explains this: "many churches in North America don't sponsor a single ministry in their own communities. Those that do tend to support ministries like food banks, which help a bit with immediate needs that also sustain people in their dependency. Very few churches become directly involved in initiatives that are designed to empower neighbors or create more resilient and just local communities." (p. 100) Given such a quote, Sine instead presents an approach to "changemaking" that is rooted in a desire for long-term transformation, and grounded in one's own community, and a call to churches to become more involved in their neighborhoods in this way. Fortunately, Sine does more than just tell stories. Pulling from the wisdom of such diverse places as tech companies, non-profits, and and the business world, he presents many principles for community engagement, from imagining how one's community may change in the next five years, to asking how one's church can help shape a more hopeful reality, to envisioning and implementing the steps to accomplish such molding. Sine's book is one of many putting out the call to address issues in local places, and he offers many helpful ideas to this end. However, there are a few things that got in the way for me. First, even though he does present some steps for practical application, the stories still occasionally overpower them. He uses so many that it's easy to feel bogged down by narrative at the expense of implementation. Second, even though he often encourages churches to help their local communities, said stories and examples often come from what people are doing in other parts of the world, helping to reinforce the mistaken idea that service and mission happens "over there" rather than right where we are. Finally, while there is much wisdom to be found in the business world that can be informative for churches, he also brings much of the jargon with him as he explains his ideas, such that at times the book reads like an extended mission statement full of corporate double-speak. 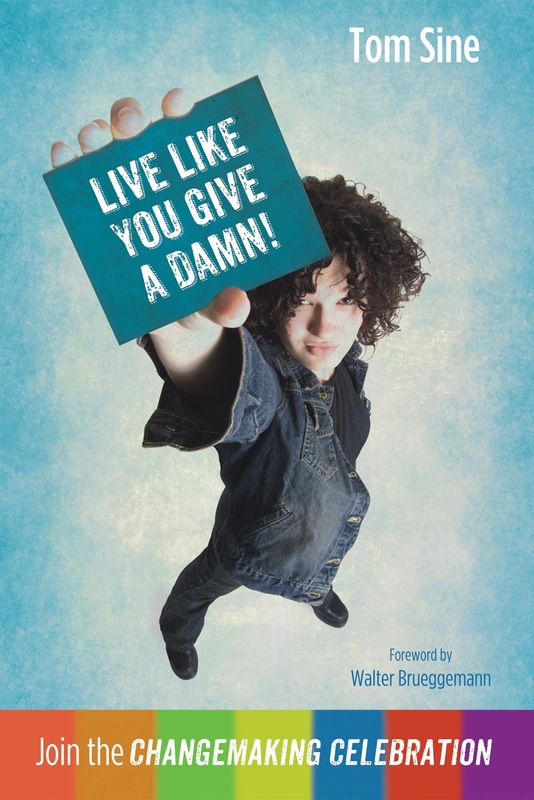 The overall message of Live Like You Give a Damn! is a good and needed one: strive to make a difference where you are to help usher in a better tomorrow. Some of the presentation works against that message, but the basic call and wisdom can be found if one takes the time to see it. Here's my latest at the UCC's blog, titled "The Blessing of Failures:"
1. The second season of Unbreakable Kimmy Schmidt released on Netflix in April, and we finally sat down to slowly binge our way through it this month. Kimmy continues her adjustment to life after being trapped in the bunker, this time around finally visiting a therapist whom she finds through unconventional means. Her friends Titus, Lillian, and Jacqueline also get into misadventures of their own, including finding love, protesting the hipsterization of the neighborhood, and trying to maintain her high society status, respectively. But the main story is Kimmy's finally reconciling with her feelings about the bunker, which of course play out in sometimes ridiculous ways. But the wackier moments of this show are always grounded in a warmth that help the viewer care about the characters beyond whatever silly thing they end up doing next. 2. I read When Breath Becomes Air by Paul Kalanithi this month. Kalanithi was a neurological surgeon who, in his mid-30s, was diagnosed with terminal lung cancer. He decided to write about his experience going through the process of receiving treatment and preparing for death. The first section is his preparation to become a doctor, with aspirations and life ahead of him. The second is his life post-diagnosis, where he wrestles with identity, vocation, and quality of life issues. The epilogue is written by his wife Lucy, who beautifully describes Paul's final weeks before his death, and the love that he both showed and was shown during that time of farewell. This book doesn't romanticize or dramatize death, nor is it a simple encouragement to "make the most of your life." It simply describes how the specter of terminal illness changed a person's life, and what he did to manage through it. I found it incredibly well-written and thought-provoking, and I'd highly recommend it. 3. I also read Ex-Patriots by Peter Clines this month, the second in his series about superheroes helping organize survivors in Los Angeles after the zombie apocalypse. This installment features the heroes' discovery of a military base of fellow survivors led by a group of genetically enhanced super soldiers. The two groups explore how to work together, but there are also mysterious elements not quite on the up and up with the LA group's new friends. I liked Clines expanding his universe a little this time around. These books have been fun, light reading; I look forward to continuing the series. 4. I also read Jacaranda by Cherie Priest, a novella set in her Clockwork Century universe about a strange hotel where many guests die under mysterious and gruesome circumstances. Father Juan Miguel Quintero Rios is invited to help investigate, along with Texas Ranger Horatio Korman, a familiar figure to Clockwork Century readers. This book pivots from the usual stories of steampunk machines and zombies to more of a straight up horror story, and much like Clines' series isn't the heaviest fare (I finished it in a day). But any story revisiting this world and these characters is bound to get my attention. As a pastor, I've been a part of quite a few attempts to raise greater awareness of the world's many needs, as well as to organize projects and programs to respond to at least some of them. My own record of success is mixed, with some catching people's interests and energy and others not so much. In each case, I've attempted to take time to evaluate why certain things have worked and others haven't, the latter also raising questions about how to encourage more growth in faith and discipleship as well as greater effectiveness in advancing God's concern for the "least of these" among us. 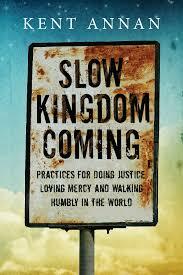 These issues are at the heart of Slow Kingdom Coming: Practices for Doing Justice, Loving Mercy, and Walking Humbly in the World by Kent Annan. Annan begins with the acknowledgment that many who attempt to engage in mission and service opportunities of various kinds may wonder about the difference such efforts make: we may burn out from doing too much, become bored with routine or disappointed with how little changes, or perform a token gesture to assuage our own guilt. Whatever the attitude with which we approach such action, Annan proposes that there is a more holistic way to serve involving a shift in perception. Annan suggests five practices to aid in this shift: attention, confession, respect, partnering, and truthing. He describes each of these both through accessible theological language and illustrative story. Attention could also be called "awakening," as Annan describes the process of waking up to the world's needs. However, it is also an awakening to one's own passion: "Part of this practice of attention involves asking ourselves, what breaks my heart? In the world, my country or my neighborhood, what makes me angry because it should be better?" (p. 32) This practice is internal as much as external, as we intentionally notice what needs raise passion within us that will help us focus our time and energy. 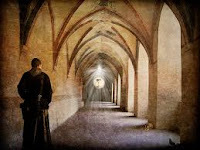 Confession is our acknowledging our own half-hearted efforts at serving for a variety of reasons, some that he mentions being doing things for show, acting out of privilege, and operating with a hero complex. Service is good, but it can be done for the wrong reasons. Confession helps us name them in order to begin reorienting on the right ones. Respect involves seeing the people you're serving as fully human and entering more deeply into the other's situation: "visitors should come to learn, not to save." (p. 74) Annan more than once points out the flaws in short-term mission trips, cautioning against "poverty tourism." Instead, those seeking to serve should be quick to listen and slow to impose one's own voyeurism and values on another. This leads to partnering, which Annan describes as serving alongside others rather than coming in to fix something with which we're ultimately not that familiar. To show respect, one must see others as equals rather than those poor people we've come to save. Finally, Annan borrows the concept of truthing from geology, where scientists compare aerial satellite images of an area with data collected through exploration of the same area on the ground. Annan uses this to describe the difference between studying an issue from far away and being immersed in it up close. The latter involves remembering the other four practices he describes, as well as realizing that God's kingdom comes a lot more slowly when you're actually in the thick of serving others. Annan has written an honest assessment of what making a difference in the world really entails. As the title suggests, transformation often happens at a much slower pace than we'd like for a variety of reasons. But using the practices he suggests, we can at least help things along in a more realistic fashion that appreciates nuance and acknowledges our own limitations. God's kingdom may be coming slowly, but there is yet hope that it's at least coming. I've been wanting to write something about the Orlando shootings, but I don't think that my voice is the correct one for people to hear in this particular case. So I asked my good friend and pastoral colleague the Rev. George Miller to share some of his thoughts instead. With permission, this has been reposted from his blog, where it originally appeared the morning after it happened. Statistically speaking, we are living in the safest time in human history...ever. But when mass violence takes place we become full of fear. Right now a 1,000 voices are saying 10,000 things about an event not many people fully know enough facts about. Again, I find myself numb and unsurprised. Partly, because I'm the son of a NYC cop and have always known these things can always when one is in public. Partly, because I'm a gay man who came out in 1991 at a time when "gay-bashing" was real and we all knew people who were attacked entering, leaving or at a nightclub. For better or for worse, these two realities (being a cop's son and an openly gay man) have informed my perception of reality- that I or my friends can easily be hurt for being who we are or who we are with. This is why you see me smile when I'm out and about, or why I am quick to raise a glass in cheers- it's not because I'm oblivious or intoxicated- it is a cheers to light and to life, and to the awareness that I could not live as I live or be who I am if it was 1950, 1960, 1970 or even 1980, or if I was living in an other country. It's also the knowledge that since I have a diverse radius of friends, many of them may not be welcomed for a variety of reasons. 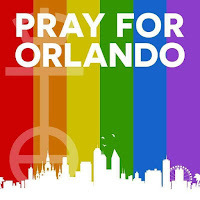 I don't know who entered into the nightclub Pulse (and please know- it is a gay club), and the reasons as to why he felt the need to kill, and wound, and hold hostage all those people. I don't know what his religious beliefs were and were not, or if there were issues of mental illness or personality disorder, or jealousy, or unexpressed rage that was boiling over. I worry that people and the media are quick to make assumptions, to point fingers, to take sides, to make demonic one group of people, to think they have all the answers when it comes to guns or rights or morality. All I know is that a tragedy happened really close to home. So close are all of us are probably associated to a victim, survivor or perpetrator by 1-3 degrees. People are scared. People are confused. People are worried. A Facebook page has already been established, so people in Orlando can check off that they are alright so their Facebook friends can know they are ok. It appears that everyone I know in Orlando was far from the scene. Now, people wonder what to do. Light a candle? Hold a prayer service? Give blood? Go out and rough house a Muslim? Say the gays got what they deserve? Claim this is an act of judgement from God? I know what I will do- keep on living. Keep on going out with my friends. Keep on attending public functions. Keep on lifting up a glass of wine in celebration of life. Keep on connecting with God. Keep on giving thanks that we belong to a church and a denomination that tries our best to welcome, to not judge, to not condemn. To keep celebrating the gift of grace that comes from our faith in Christ; grace that says because God loves me, I am free to love and to be loved. That because of grace we don't have to be so quick to judge, to be filled with hate, to purposely want to hurt another. Why would anyone go into any club or public place and want to kill anyone? I don't know, but I do know that our fear means they won. And I don't want them to have that power over me or anyone else. So today, whatever you do, find a minute, a moment, a second to give thanks for what you have, for who you are, and find a way to embrace life, even if it is as simple as saying thanks to God, watering your flowers, calling a family member or friend, or having an extra glass of wine. This is not the last time an event like this will take place. But remember, God (as experienced in the Father, Son, and Holy Spirit) is eternal and will always have the last say. As a lifelong committed reader, I've been fascinated in recent years by analyses and opinion pieces that try to describe the changing reading habits of our culture. Some lament the popularity of ebooks and openly wonder if we will soon see the death of printed paper works. Others take this worry a step further, suggesting that our collective attention span has become shorter due to screen media such as TV and the internet, which has led or will lead to less of an interest in books due to their length and depth. And still others envision a time when libraries will become completely obsolete thanks to online resources and search engines, given that some brick and mortar bookstore chains are already suffering from the effects of their existence. There is also plenty of pushback against these ideas, with many also arguing that books will always have a place in our society, along with the people and places that love and keep them. Books and reading still shape us as individuals and communities, and libraries and similar havens still serve plenty of important functions for neighborhoods and cities. Reading still shapes us, even in an age where so much seems to discourage or lessen its potential impact. 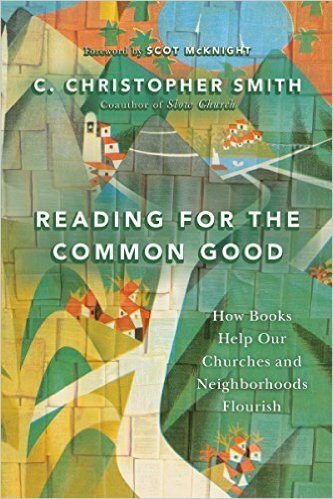 This latter view is one championed by C. Christopher Smith in Reading for the Common Good: How Books Help Our Churches and Neighborhoods Flourish. Smith is a member of Englewood Christian Church near Indianapolis, and editor of the Englewood Review of Books, which is based in that congregation. So it might naturally fit that he has some positive things to say about the importance of reading in this shifting cultural moment. As the title and subtitle allude, Smith's basic thesis has to do with how reading shapes us as individuals and as groups. He explores this from multiple angles, beginning first with how we read in general: do we rush through from one book to the next, or do we take time to really savor and digest? This has an impact on how well we understand and absorb what we are reading in order for it to have a real transformative effect on how we think and interact with the world. From there, Smith embarks on a series of chapters showing how reading can lead to social change, whether the culture of a church, neighborhood, or entire municipality if enough are engaged: "The seeds of transformation lie, I believe, in a community (or sub community) that has an alternate vision of how life could be structured." (p. 38) In other words, a community that reads a common work and allows it to seep into its thinking and vision can be altered by the experience enough to begin acting and deciding and moving into something new, different, and life-giving. A natural question to arise might be: Why reading? Why not organizing or activism or prayer? Smith does include these other elements, but argues that reading is foundational to the rest because it informs before the action can begin. He includes contemplation as a complement to reading, noting that a slow, deliberate, thoughtful, and even prayerful pace is needed for one to really be both enriched and inspired. Smith has written an accessible and powerful call to churches and neighborhoods to take up reading as a basic component to transformation. It's also a love letter to reading in general, as he cites numerous works from diverse genres such as poetry, fiction, fantasy, theology, spirituality, philosophy, and cultural studies among others in showing how each can be that which leads to something new and different in the life of an individual or committed group. Churches looking to help their communities thrive or simply to encourage a greater appreciation of reading among their membership would find this an inspirational point of beginning. One of my daughter’s favorite shows at the moment is “Thomas the Tank Engine.” I haven’t yet figured out what she likes most about it, whether the stories or out of a growing fascination with trains. I suspect that it’s the latter. I think this message from a seemingly benign children’s program reflects a common aspiration that many have. Some like to hold prayer and action in a strange dichotomy where only one or the other really matters. Rohr's point is that both are needed, and one informs the other by keeping us grounded in the why. I guess you could call this part of my own project for the church, which is why I loved this article so much. You feel in your bones that people’s faith in you could evaporate any day no matter how hard you work. Your best ideas can fail, your weaknesses will become the topic of hushed conversations, and those who emphasize the need for change will always be the ones to sabotage your efforts at offering it. You knew at least some of this before you took the vows of ordination. But something in your soul made you get out of the boat and start walking toward Jesus’ call across the stormy waves—even though you’ve always been perfectly clear you can’t walk on water. Your family also has faith in you, which is both comfort and pressure. They want you to be successful because they love you and believe in your gifts, but they’re also counting on you to provide a safe life. So late at night when you’re fretting about the church’s crises de jour, you wonder if you should have just stayed in the boat. Barnes goes on to reflect on the importance of humility in this vocation. Some of it can be cultivated by one's own attentiveness, and some of it just happens through failure and pushback. But some of it can and should come simply by virtue of regular reminders that a congregation puts its faith in the pastor to be and do certain things, some of it reasonable and needed, and a great deal of it also not. The weight of this calling can be heavy. These are four of the reasons I became a spiritual director. Churches can be quite un-prayerful places, oddly enough. We need greater attention to the inner life in order to keep ourselves properly centered on what matters. Sure, budget and building management issues arise, but mean nothing beyond organizational maintenance if we never attend to the deeper things meant to drive the church's purpose. Spiritual direction provides one opportunity to do that. Programs were easy answers. The vast majority of churches in the 1980s were program-driven. If there was a perceived need, they would order a resource that best solved that need. Many churches today still think they can get quick fixes from programs. My own experience in the past decade-plus trying to start programs has been very mixed. For a program to really work well, you need certain levels of commitment and critical mass. But due to a few other things Rainier lists and a few he doesn't, neither of those are easy to attain any more. I've found much greater success with intergenerational special events and short-term activities than ongoing programs. Perhaps that is one of the ways forward in many places. Misc. There's a new blog called Superhero Ethics. It's fun. Carl McColman recommends 10 books on Christian meditation. S/K Linsley included me on a list of bloggers recapping the Festival of Faith and Writing. So that was nice.